Recently Smithsonian Magazine published a piece by Andrew Lawler on the signet ring found on Hatteras Island by archaeologist David Sutton Phelps. Phelps, who taught at East Carolina University, died in 2009. The 1998 discovery electrified archaeologists and historians. 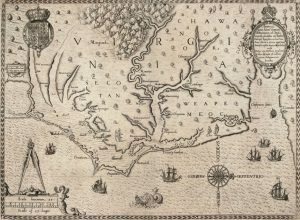 The artifact seemed a rare remnant of the first English attempt to settle the New World that might also shed light on what happened to 115 men, women, and children who settled the coast, only to vanish in what became known as the Lost Colony of Roanoke. Now it turns out that researchers had it wrong from the start. 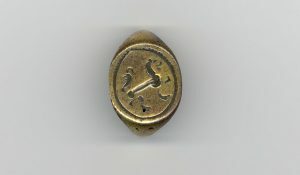 A senior member of London’s College of Arms subsequently noted that the seal on the signet ring was of a lion passant, and suggested that it might relate to the Kendall family of Devon and Cornwall. A Master Kendall was part of the first colonization attempt in 1585, while another Kendall visited Croatoan when a fleet led by Sir Francis Drake stopped by in 1586. Though this link was never confirmed, the object was nicknamed the Kendall ring. When the artist and governor John White returned to Roanoke in 1590 after three years away, he found no colonists but he did find the word “Croatoan” etched into a post set by the English. 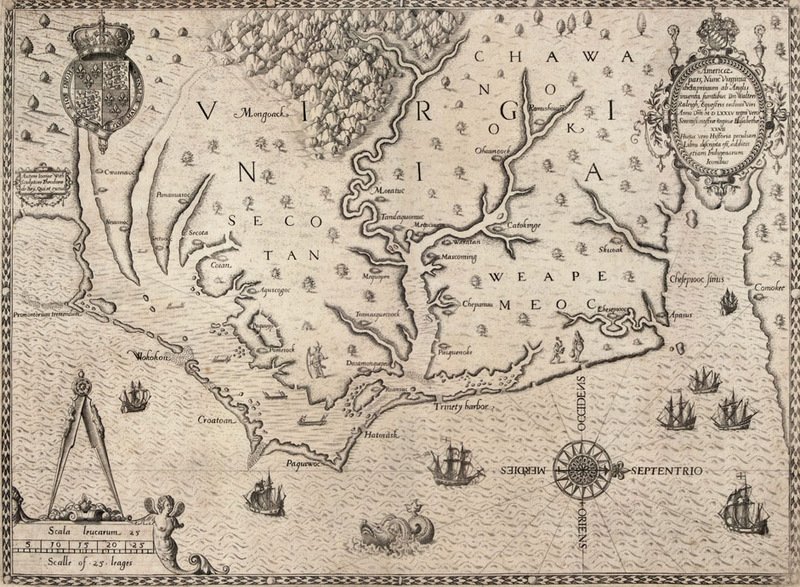 Historians have long thought that for a variety of reasons, some of the colonists may have relocated to Croatoan, today’s Hatteras, even though the evidence in White’s account shows that he thought the colonists had moved up the Albemarle Sound. 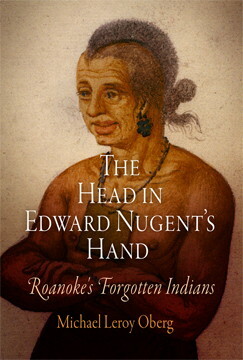 The only native peoples willing to talk to the English lived there–Manteo, baptized and named “Lord of Roanoke” by Ralegh, was from Croatoan, even though his people begged the English colonists not to hurt them and steal their food. Croatoan, morever, might have served as a workable lookout for English ships arriving through the southern route. Phelps, as a result, felt that he had found something of significance, proof that the colonists had gone to Croatoan. This has been a tough truth for many of those who are determined to find the men, women, and children who settled on Roanoke in 1587. The fate of the Lost Colonists is one of those great American historical mysteries, even though the sands and shores of the “New World,” according to surviving European accounts, were littered with the remains of many, many Lost Colonists. This fascination, which continues, is thus an example of American Exceptionalism, and it is one that students of Native American history ought to try to counter. My book on Roanoke, published a decade ago, was one effort, but there is still much work to do. A hundred or so colonists, who left Roanoke Island sometime between late 1587 and the summer of 1590, never to be seen again. That is the story. You can see it acted out in the “Lost Colony” drama, staged every year at the Fort Raleigh Historic Site. You can read about it in book after book. And here is my problem with all that. Rather than casting Roanoke and the fate of the colonists as an English story, it is more fruitful, I would argue, to recognize that the men and women sent by Sir Walter Ralegh to America intruded into a world dominated by Algonquian peoples. The English planted their first outpost on Roanoke Island in 1585, after all, only because native peoples allowed them to. When they returned in 1587, we know that they found themselves under attack, and that many of those same native peoples had little interest in assisting the newcomers. Whatever happened to the colonists, in other words, was determined by native peoples. Whether they blended in with Indians on Croatoan, or in the interior, or were wiped out by Wahunsonacock and his warriors from the Powhatan Paramount Chiefdom, native peoples determined the fate of the Lost Colonists. Yet native peoples in these stories are largely invisible, their motives and their perceptions of the English (and, yes, these perceptions can be unearthed through a careful reading of the surviving documents) not a factor. Roanoke is an English story, when all the evidence suggests that this is a story of indigenous peoples dealing with a small group of outsiders who likely never learned how to play by Algonquian rules. We historians who study the Native American past need to counter American Exceptionalism wherever it presents itself. We need to move native peoples into the heart of our national story: American history cannot be told accurately without Indians, and in the era before the Civil War especially, native peoples were far more dominant and powerful and sovereign than white American narratives allow. These exceptionalist, settler-state narratives, then, are not only historically incorrect, but dishonest at a fundamental level, in that they erase native peoples from an American story that they helped to create and shape and make their defeat and marginalization and dispossession of these communities seem inevitable, foreordained and thus forgiveable. Though Smithsonian is increasingly looking like a travel magazine for old people, like Modern Maturity with less stuff about heart health and diet, it has the resources to do a better job on these issues. David Sutton Phelps thought the ring he found could prove the location and fate of the Lost Colonists. He thought it was made from gold. It wasn’t. The ring was, like his interpretation, brass, something much less than he thought. The story of the Lost Colonists will not be complete until the native peoples with whom they interacted are placed at the center of the story. After reading this first article from Smithsonian I am astounded that most of the argument for the colonies position rests on a single ring with uncertain provenance. This astounds me mainly because colonists did not survive in North America without some connection to nearby native communities. This connection was made through trade. Weapons, jewelry, ceramics and glass beads were commodities to Native American communities that Europeans had. It would be more likely that this supposed “missing link” was a ring that was traded for native goods such as furs, agricultural products, or slaves. During the excavations on Hatteras, many native artifacts were overshadowed by the European finds. This article and others about this ring show the narrow focus of archaeologists researching this colony. In an article from National Geographic, the head archaeologist, Mark Horton, commented that “the evidence is that they assimilated with the Native Americans but kept their goods” (National Geographic, 8/7/15). This statement is not supported historically or by the archaeological record of the site. The archaeologist at this site is failing to call into account the likelihood that this ring was likely given over to native peoples through trade around a century after Roanoke had died out. European trade goods found in native communities is far from extraordinary. It seems that archaeologists at this site are ignoring the relevant information we know about colonial native trade relations. Thanks for this note. I would not be surprised if the “Lost Colony” was never found. The best place to look would be at the head of the Albemarle Sound, where some promising work has been done, and not on the Outer Banks. I never really bought the “Kendall” assumption because it depended on an apparently erroneous conclusion that some of the Elizabethan Kendalls were then bearing arms that displayed a lion passant, when, depending upon how you hold the ring it might be instead a lion rampant, assuming it was heraldic at all. In the 1580’s there were four geographic prominences in the area of Roanoke bearing the name Kendrick, two of these mentioned in (1) the Journal relating White’s return to and landing at and later departing from (during a burgeoning hurricane) Kendrick Mounts (Nag’s Head/Kitty Hawk) to hunt for the colonists and (2) the earlier indications that they entered Pimlico Sound through a deepish passage at Cape Kendrick, since obliterated by the Atlantic. Moreover, the oldest available mapping of the western headwaters area of Albemarle Sound showed two more such prominences: (3) someone named Kendrick lent his name to a creek that enters the sound from the South and (4) there was a a lake once known as Kendrick Lake located even farther inland and southward, but today called Mattapungo Lake. It was smaller than and West of Phelps Lake. Barlow’s and Amadas’ communiques, White’s account of the failure to rescue, etc..
One more thing: the Kendalls were prominent London fish mongers and whenever authorized by the college of arms to display anything Elizabethan in context, it was a crest displaying frolicking porpoises, sunfish or some other aquatic merchandise. The wealthy Elizabethan Kendricks, however, were authorized to display a lion rampant. If as seems probable, this Hatteras ring was a form of trade goods, it seems to me a more reasonable hypothesis that the trader was one of the Kendricks, and possibly not one sent with the ill-fated colonists but someone with some standing, and as education who got there rather earlier, perhaps with the military reconnaissances and surveys instigated for Gilbert’s and his cousin Ralegh’s accounts, these antecedent to White’s colonist setting up without the necessary provisions to see them through. One of the Kendricks’ young swains may have had to flee England; there was a published account in the late 1500’s of a scandalous dalliance by a young Kendrick with a certain Lord —–‘s wife while he was away at court. There was a scandal about their affair at the time. Discretion might have involved an hastily organized but not entirely voluntary adventure to Pars Virginae with other young entrepreneurs out for fresh adventure, not fleeing one.